This weekend I was itching to go buy our Christmas tree, but I really try to wait till at least the 2nd week of December, because I never fail to kill our tree. I figure the less time I have it the less likely I am to make her turn yellow. My first thought this year was to buy a tree that is planted…I am sure I saw something crazy on Pinterest and was like of course this is a good idea. Well after thinking it through I realized 1. who sells potted evergreens this time of year in northern Michigan? 2. the ground is frozen how will I plant it after we are done with Christmas? Both of those two things seemed to be brick walls in my plan. SOOOO I have now decided getting a normal tree is all good, but my problem is I have 4 ornaments and probably need to start committing to my holiday decor, huh? My personal style when it comes to Christmas is much more non-traditional. I like Christmas decor that challenges the traditional, and almost could work for any holiday. 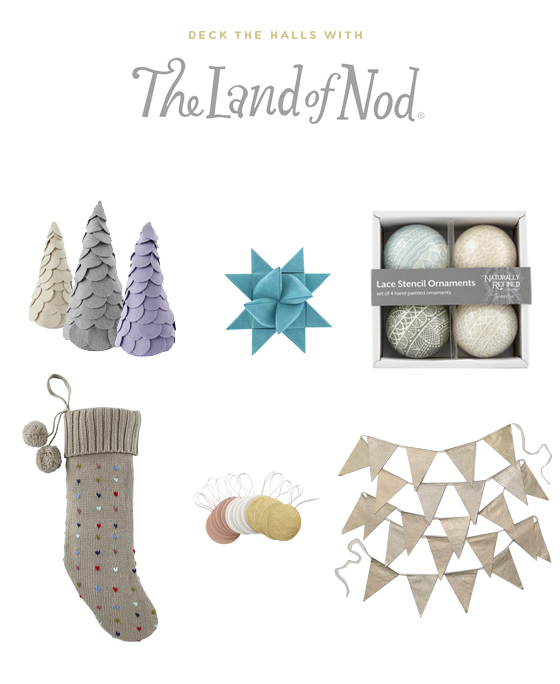 So when I came across the decor from Land of Nod (yes! Land of Nod! They have more than just kid’s stuff and even the kid stuff, I want!) I instantly fell in love with the hand crafted ornaments that don’t break, the adorable buntings and garlands, as well as the fact that they partner with some of my favorite illustrators. Currently all their decor is on sale and I am really thinking of making some purchases for our tree this Christmas. After returning from traveling it has been hard to buy anything that doesn’t have multiple uses. I want less, but when it comes to Christmas I think a few ornaments on the tree are okay. I cannot be a Scoorge, right? wow i’m so glad i stumble upon your “land of nod” post today because those handmade christmas decorations are just so pretty… thanx for sharing ! There’s nothing a love more than downright elegant holiday decor… the more eccentric the better! Love neutrals mixed with subtle sparkle like those Lace Stencil ornaments from Land of Nod. Happy decorating! oh these are sooo cute! I never would’ve thought to check them out for christmas things! O my the coloring of all these are gorgeous!! These handmade goodies are defiantly better then the traditional rout of holiday decor!! Thanks for opening my eyes to these goodies!! So much Christmas cuteness in one place. Love it all! I know what you mean about Christmas tree’s dying- I’m one for always getting it to early and sure enough there are needles everywhere for weeks! WHOA that is awesome!!!! Thank you!!! This is awesome. I meant to tell you that! Seriously loved the info!! !